I recently realized I have never been satisfied with any wallet I’ve ever owned. It was time for that to change. I thought about the Slimmy (which still looks pretty fantastic), until I remembered reading an interview with William Gibson. He talked about some crazy wallet made out of a material called Cuben. Now this sounded promising. I headed off to Google and searched for “william gibson wallet.” The top result took me to a review of the Yasutomo Wa-Ben wallet at unfinishedman.com. 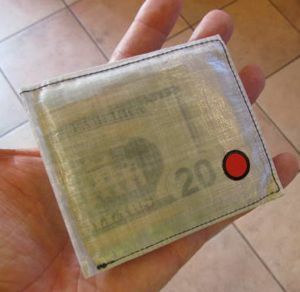 Chad’s review convinced me that the Yasutomo 2020 Wa-Ben wallet, made in Hong Kong by Jason Hung and touted as the world’s first Cuben Fiber wallet (specifically, Cuben Fiber CT9K.5), could be exactly what I was looking for. So I slapped down an electronic $49.50 (post-paid from Hong Kong), and three weeks later I signed for my new wallet at the post office (it seems the people in charge of these decisions deem packages from Hong Kong as untrustworthy). After carrying it around daily for about a week, I can say it was exactly what I was looking for. The wallet is extremely light (0.69 ounces, according to the website), extremely thin (you can see through it! ), and extremely durable. I often forget I’m even carrying it and have to frantically check my front pocket to see if it’s there. It always is. It has six credit card pockets, two “hidden” pockets behind the card pockets, and two cash/note pockets, so there’s plenty of room to carry more than enough. So here’s my short review. The Yasutomo 2020 Wa-Ben wallet is fabulous piece of gear, and I recommend it highly for anyone looking to lighten their everyday carry load.